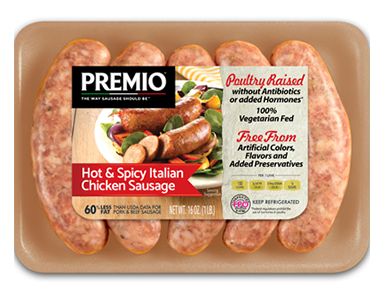 If you love sausage, but you’re trying to cut back on fat, try Premio ABF Hot & Spicy Italian Chicken Sausage. With 60% less fat than USDA data for pork and beef sausage, our spicy, antibiotic-free sausage delivers the perfect amount of heat right to your table. Make it the star of your meal or add it to your favorite recipes, just make sure you serve Premio ABF Hot & Spicy Italian Chicken Sausage! Ingredients: Chicken, Less than 2% of the following: Salt, Dextrose, Vinegar, Lemon Juice Concentrate, Spices (including red pepper & anise), Paprika, Dehydrated Onion, Dehydrated Garlic, Dehydrated Parsley, Natural Flavors. Stuffed in Hog Casings. Oh, my! If you love living your life a bit on the spicier side, you’ll appreciate this chicken sausage. It’s our ABF hot and spicy Italian chicken sausage, and it’s ready to heat up all your dishes. Your cooking will come alive thanks to our proprietary blend of spices that keep you coming back for more. Be sure to buy enough packages of this Premio Foods favorite. It practically flies off the shelf! Did you know eating foods with a little bit of heat can actually be healthier? Studies have shown that we tend to eat fewer calories when the spice is revved up. Plus, spicy foods can help our body’s natural systems break down foods and may even increase metabolism. Regardless, you’ll appreciate how much flavor you get in every juicy, tender bite of our ABF hot Italian chicken sausage. Pair it with a cool drink, and you’re ready for a party! Has your cooking gotten a little boring? Feel like you need some way to change up the foods you make on a regular basis? Look no further than our delectable ABF spicy Italian chicken sausage. Chicken sausage comes to you in a secure package, and it can be prepared in plenty of ways. For instance, many of our regular customers love to turn on their grills – even in the wintertime! – to add increased flavor to the exterior of the chicken sausage. Plus, those grill marks are a beautiful sight when you’re making a sandwich! No grill? No problem. Just place the chicken sausage in a skillet or pan on the top of the stove and heat it up. Be sure to turn it over regularly so it cooks evenly from the outside to the flavor-bursting interior. Voila! Your chicken sausage is done to perfection. Finally, be sure to include some diced hot and spicy chicken sausage pieces in your soups and stews. You don’t even have to cook the sausage bits first. Simply add them to the broth or gravy and continue cooking until they are completely heated throughout and ready to eat.